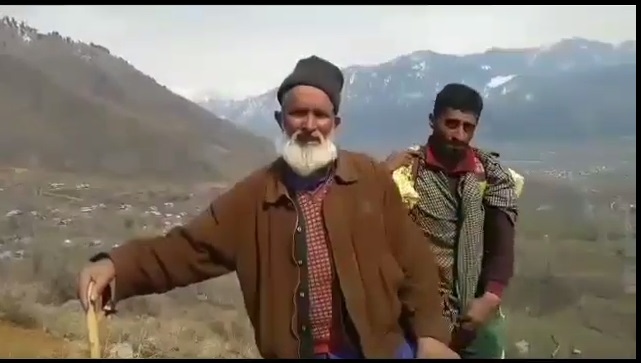 Gujjars living in Douban area of Onagam village, in district Bandipora, are far from the slightest touch of development in the 21st century. In Douban, Gujjars are devoid of basic facilities such as water, electricity, transportation and education. The women of the Gujjar families have to walk all the way to a broken water supply pipe to fill their buckets with whatever quantity and quality of water comes from it. This water is then used for drinking, and house chores purposes. Also, they have to walk and climb up the hills, because roads are nowhere. “The pregnant women have to walk to the hospital through the hilly terrain, and sometimes deliver on the way. We fear for the life of our women and unborn child,” said a resident. “There is a school in the area, only till 5th class, but the teacher does not come to teach our kids,” he rued. Even after setting up electricity poles five years ago, the authorities have not provided wires and consequently, power to their houses. Douban, a remote area, is inhabited by 60-70 nomadic families, called Gujjars. They are also listed as a Scheduled Tribe. Their life in Douban reminds of stone age life. They said the government might be doing a lot for the citizens, but it hardly reaches them.